Members of DeustoTech Energy accompany the mayor of Zamudio and a representation of the Commonwealth of the Txorrieri in his visit to the facilities of the Commonwealth of Sasieta. 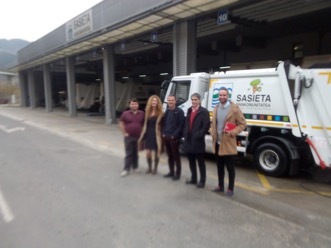 During the visit, the technicians of the Commonwealth of Sasieta presented us both the technological and social deployment that has been making in the last years with the aim of improving the system of collection of urban waste. An interesting visit that will help to better define the objectives of Waste4Think. This entry was posted in news, Zamudio and tagged Sasieta, Zamudio. Bookmark the permalink.